The 23,000-acre Kapalua Resort on Maui's northwest shore offers an interesting choice for anyone looking into destination clubs and fractional ownership. Kapalua Resort encompasses emerald mountains running all the way down to pristine, white sand beaches. It is surrounded by the protected West Maui rainforest, two marine sanctuaries and is home to a working pineapple plantation. The resort offers 12 dining options ranging from casual fare to five-star restaurants, a tennis center, two championship golf courses and the exciting outdoor activities of the Kapalua Adventure Center. The latter offers Full Moon and Sunset Zip Tours featuring an adventure-packed expedition on two scenic ziplines over Kapalua Nui's dramatic ridges and ravines. The resort also boasts several gorgeous beaches and it's own rainforest. 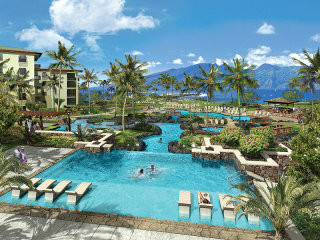 Both Exclusive Resorts and Ritz-Carlton have recently opened homes for their members at Kapalua Resort. The largest destination club has 12 three-bedroom condominium style residences, which average 3,000 sq.ft in size. Each one has a full kitchen, large lanai and a "summer kitchen", with contemporary décor and local art. Exclusive Resorts members have full access to the world-class resort amenities. This includes access to Kapalua Bay Club, two championship golf courses, the 30,000 sq. ft. spa, all the Ritz-Carlton Club & Residences amenities and Jean-Michel Cousteau's Ambassadors of the Environment children's program. Ritz-Carlton recently announced it's new destination club, which offers two types of membership - both of which are available at Kapalua. The new Ritz-Carlton Club property boasts 62 fully furnished, two- and three-bedroom residences with floor plans ranging from approximately 1,912 to 2,257 square feet. The interior design draws on the island's history such as pineapple plantations and vistas of Mount Haleakala. "Home Club" members purchase a deeded, one-twelfth fractional ownership interest giving them the opportunity to stay 21 days per year in Kapalua, while enjoying the personal services of a concierge staff and a multitude of resort amenities. Prices start at $350,000 per interest. This type of membership works well for people who know they want to visit Kapalua on a regular basis. If you prefer to have a wider array of travel locations, then "Portfolio" members have an interest in a collection of Ritz-Carlton residences and can choose where and when they travel. Other locations include Aspen, Vail, St Thomas, the Bahamas and San Francisco. This sets up an interesting choice for anyone who likes Maui. If you're a big fan of the island and know that you want to spend several weeks each year, then the Ritz-Carlton home club should be on your list to review. On the other hand if you line Maui, and also want other travel destinations both Exclusive Resorts and the Ritz-Carlton Portfolio Club offer a variety of locations and membership options. For a much more in-depth comparison of destination clubs, including questions to ask the clubs, download our free Guide to Destination Clubs.